A tutorial on the basics of using LEDs (light emitting diodes). Polarity, forward voltage and current are discussed. The light-emitting diode is abbreviated as LED. It is made of a compound containing a Ga, As, P, N, and so on. The making principle of LED is when the electrons and the holes are combined, the visible light can be radiated. It is one of the semiconductor diodes that can convert electrical energy into light energy. Compared with ordinary diodes, light-emitting diodes are composed of a PN junction and have unilateral conductivity. When a forward voltage is applied to the light-emitting diodes, the holes injected from the P region to the N region and the electrons injected from the N region to the P region are combined with the electrons and holes in the N region and the P region in the vicinity of the PN junction, respectively, to produce spontaneous emission fluorescence. The energy states of electrons and holes in different semiconductor materials are different. So when their electrons and holes are combined, the energy released is different, and the more energy is released, the shorter the wavelength of light. E is the power supply voltage, the UF is the forward voltage drop of the LED, and the IF is the normal operating current of the LED. The core portion of the light-emitting diode is a crystal sheet composed of a P-type semiconductor and an N-type semiconductor, and a transition layer is formed between the P-type semiconductor and the N-type semiconductor, referred to as a PN junction. In the PN junction of some semiconductor materials, if the injected minority carriers are combined with the majority carriers, the rest will be released in the form of light, that is, the electric energy is directly converted into light energy. When the reverse voltage is applied to the PN junction, and the minority carriers are difficult to inject, so that no light is emitted. When the current flows from the LED anode to the cathode, the semiconductor crystal emits light from ultraviolet to infrared colors, and the intensity of the light depends on the current. 1) Allowable power (PM): The positive DC voltage added to both ends of the LED and the maximum value of the current that flows through it. Beyond this value, the LED will be heated and damaged. 2) Maximum forward DC (IFM): Maximum positive DC current allowed to be added. Exceeding this value will damage the diode. 3) Maximum reverse voltage (VRM): Maximum reverse voltage allowed. If this value is exceeded, the LED may be corrupted. 4) Working temperature: Making a temperature range based on the requirement that LED works with. When exceeding this range, the LED will not work properly and will greatly reduce efficiency. 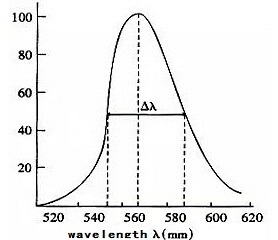 1) Spectral distribution and peak wavelength: Light generated by light-emitting diodes is not a single wavelength, and its wave growth body is shown in Fig. 2. It can be seen from the diagram that the intensity of λ =100 wavelength is the largest, and the wavelength is the peak wavelength. 2) The luminous intensity of IV: Light emitting diodes usually refers to the light intensity in the normal line direction (for cylindrical light-emitting diodes, the axis is its axis). Due to the luminescence intensity of normal LED is 2, the luminescence intensity is usually candela (MCD). 3) The spectral half-width (1/2): It indicates the spectral purity of the light-emitting tube. It refers to a difference between the two wavelengths corresponding to the peak intensity of the light in Fig. 3. 4) The half-value angle θ1/2 and the angle of view: θ1/2 is the angle between the direction of light intensity value and the axial direction (normal direction) of the axial intensity value, and the half-value angle is twice the angle of view (or half-power angle). Fig. 2 shows the angular distribution of the luminous intensity of two different types of LED. 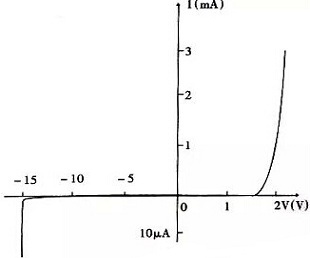 The coordinate of the vertical (normal) AO is the relative luminous intensity, that is, the ratio of the luminous intensity to the maximum luminous intensity. 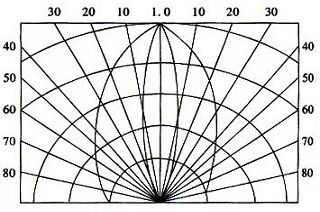 Obviously, the relative luminous intensity of the normal direction is 1, and the larger the angle of the normal direction, the smaller the relative luminous intensity. And this graph can get a half-value angle or an angle of view. 5) The forward working current (IF): It is the positive value of LED when it is normal. In practice, you should select a IFM below 0. 6. 6) The forward operating voltage VF: Obtain the working voltage in the parameter table at a given forward current. In general, it is measured under IF=20mA. In VF, the forward voltage of the LED is 1.4 ~3V. And when the external temperature rises, the VF drops. 7) V-I characteristics: The relation between the voltage and current of the LED is shown in Fig. 4. When the forward voltage is less than a certain value (called threshold), the current is very small and does not emit light. When the voltage exceeds a certain value, the forward current increases rapidly with the increase of the voltage and is illuminated. The forward voltage, reverse current and reverse voltage of the LED can be obtained from the V-I curve. The reverse leakage current of the forward light emitting tube is lower than 10μA. Light-emitting diodes can be divided into four types: transparent, colored, and colorless. In addition, scattered light emitting diodes are used to guide lights. White: It is usually represented by the color coordinates below, or simply showed with warm white, right white, cold white. 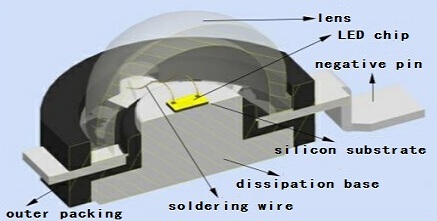 Generally, the five main raw materials of LED are: wafer, bracket, silver glue, gold wire, epoxy resin. In 1993, at that time, Shuji Naka mura, who worked at Nichia Corporation in Japan, invented a blue light LED with commercial application value based on wide-gap semiconductor material nitride (GaN) and silicon nitride (InGaN), which was widely used in the late 1990s. In theory, the blue LED combined with the original red LED and the green LED can produce white light LED, but the white light LED is rarely made in that way. Most of the current white-light LED is made by covering the blue LED (near-UV, wavelength 450nm~470nm) with a yellowish phosphor coating, this yellowish phosphor is usually made by grinding the cerium-doped yttrium aluminum garnet (Ce3: YAG) crystal into powder and mixing it in a dense adhesive. When a LED chip emits blue light, some of the blue light is efficiently converted by this crystal into a mostly yellow light with a wider spectrum (the spectral center is about 580nm). Since the yellow light can stimulate the red and green light receptors in the naked eye, with the blue light, so that it looks like white light when these colors mixed, and its color is often referred to as moonlight. The method of making a white light LED was developed by Nichola Corporation and used on the production of a white light LED from 1996. To adjust the color of the light yellowish light, it is possible to replace the Ce doped with the Ce3 +: YAG with other rare-earth elements, or even in a manner that replaces part or all of the aluminum in the YAG. Based on the characteristics of its spectrum, red light and green light are not as obvious as the broad-spectrum light source illuminated. In addition, due to the variation of the production conditions, the color temperature of the finished product of the LED is not uniform, therefore, the characteristics of the finished product should be distinguished during the production process. Another method of making a white LED is like a fluorescent lamp. An LED that emits near ultraviolet light is coated with a mixture of two phosphors, one is europium which emits red light and blue light, and the other is copper and aluminium doped with ZnS which emits green light. However, the epoxy resin in the adhesive will be cracked and deteriorated caused by the ultraviolet rays, the production difficulty is high, and the service life is also shorter. In contrast to that first method, it is less efficient (producing more heat) but its spectrum is better and the light looks better. One of the longer of the two leads of the light-emitting diode is the positive pole, which should be connected to the positive pole of the power supply. Some LED leads are the same length, but there is a convex tongue on the shell, the lead near the small tongue is positive. The LED can only be turned on in one direction, called forward bias, when the current flows, electrons and holes recombine to emit monochromatic light, which is an electroluminescent effect, and the wavelength of the light and the color is related to the type of semiconductor material used and the element impurities to be incorporated. It has the advantages of high efficiency, long service life, difficult breakage, high switching speed, high reliability and so on. The light-emitting efficiency of the white LED has been obviously improved in recent years. Compared with the incandescent bulb and the neon lamp, the light-emitting diode is characterized in that the working voltage is very low, and the working current is small, the impact resistance and the anti-seismic performance are good, the reliability is high, and the service life is long. The intensity of the light-emitting can be conveniently modulated by the intensity of the current passing through the modulation. Due to these features, the light-emitting diode is used as a light source in some photoelectric control devices, and is used as a signal display in many electronic devices. LED uses a low-voltage power supply, the supply voltage is between 3~24V DC, depending on the product requirement, there are a few DC 36V or DC 40V, so it is a safer power supply than the use of high-voltage power supply, especially suitable for public places. The energy consumption is 80% less than the incandescent lamp with the same light efficiency and 40% less than the energy-saving lamp. Because of its small size, each unit of LED is a square of 3~5mm, so it can be fabricated into devices of various shapes and is suitable for variable environment. 100,000 hours, light attenuation is 50% of the initial. The response time of the incandescent lamp is milliseconds and the response time of the LED lamp is nanosecond. No harmful metal mercury, etc. The red, yellow, green, and blue orange multicolor luminescence can be realized by adjusting the energy band structure and the band gap of the material conveniently through chemical modification. The operation voltage of red light tube is small, and the operation voltage of red, orange, yellow, green and blue light emitting diodes is increased in turn. Several important aspects of optical parameters of LED are: luminous flux, luminous efficiency, luminous intensity, light intensity distribution, wavelength. The luminous efficiency is the ratio of the luminous flux to the electric power, and the unit is generally lm/ W. The luminous efficiency represents the energy-saving characteristic of the light source, which is an important index to measure the performance of the modern light source. The intensity of LED luminescence is a characterization of its intensity in a certain direction. Since the intensity of LED varies greatly in different spatial angles, we have studied the intensity distribution of LED. This parameter is of great practical significance and directly affects the minimum viewing angle of the LED display device. For example, the large-scale LED color display in gymnasiums and stadiums, if the distribution range of LED single tube is very narrow, then the audience facing the larger angle of the display screen will see the distorted image. And traffic signs also require a wider range of people to identify. 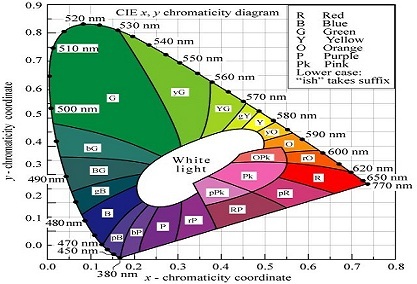 For the spectral properties of LED, we mainly look at whether its monochromatic property is good, and we should note that the main colors such as red, yellow, blue, green, white LED are pure or not. Because in many cases, such as traffic lights, the color requirements are relatively strict, but it is observed that in some LED lights in reality, green looks blue and red is dark red. From this point of view, it is necessary and meaningful to study the spectral properties of LED. Plug-in LED, in addition to the common two-terminal monochrome LED, also includes three-terminal dual-color LED and four-terminal RGB full-color LED. A surface-mount LED is usually available in 0402, 0603, 0805, 1206, and so on, in monochrome, two-colour, and RGB full-color type. This type of LED is usually used for lighting source, and most of it is white-emitting LED. By making more than one LED into each field and forming a characteristic letter or combination, you can display the 0/9 or English letters) or the bar-type to indicate progress or scale. The matrix form of LED can display Chinese and English letters. For example, the manufacturer's LED display screen is composed of these dot matrix screen modules. According to color, it can be monochrome, double color or RGB full-color type. This type of LED includes not only a LED core, but also a control circuit, IC, for specific functions, such as blinking flash. Or bus addressing controls the color of each point, and so on. This kind of LED emits lights that are invisible to human eyes, such as infrared, ultraviolet, and so on. In daily life, we use the remote control is this kind of LED lamp. 2. Light-emitting diodes can also be divided into ordinary monochromatic light-emitting diodes, high brightness light emitting diodes, ultra high brightness light emitting diodes, chromotropic light emitting diodes, scintillation light-emitting diodes, voltage controlled light-emitting diodes, infrared light-emitting diodes and negative resistance light-emitting diodes, etc. There are two control modes of LED: constant current and constant voltage, and there are many dimming modes, such as analog dimming and PWM dimming. Most of the LED are controlled by constant current, so that the current of LED can be kept stable, and it is not easy to be affected to extend the service life of LEDs. Ordinary monochromatic light-emitting diodes have the advantages of small volume, low operating voltage, small working current, uniform and stable luminescence, fast response speed and long service life, and can be driven by various DC, AC and pulse power sources. It belongs to the current-controlled semiconductor device, it needs to be connected to a appropriate current limiting resistor. The light-emitting color of ordinary monochromatic light-emitting diodes is related to the wavelength of light-emitting, and the wavelength of light-emitting depends on the semiconductor materials used in the manufacturing process. The wavelengths of red light-emitting diodes, amber light-emitting diodes, orange light-emitting diodes and yellow light-emitting diodes are generally 650~700nm, 630~650nm, and 610~630nm respectively, and yellow light-emitting diodes are usually 585nm, green light-emitting diodes typically have a wavelength of 555~570nm. The semiconductor materials used in high brightness monochromatic light-emitting diodes and ultra high brightness monochromatic light emitting diodes are different from those of ordinary monochromatic light-emitting diodes, so the intensity of light-emitting is also different. Typically, high brightness monochromatic light-emitting diodes use materials such as gallium arsenide (GaAlAs) and ultra high brightness monochromatic light-emitting diodes use phosphoindium gallium arsenide (GaAsInP), etc. Common monochromatic light-emitting diodes use gallium phosphide (GaP) or phosphogallium arsenide (GaAsP). The variable colour light-emitting diode is a light-emitting diode capable of converting light-emitting colors. The color type of the variable colour light-emitting diode can be divided into two-color light-emitting diodes, three-color light-emitting diodes and multi-color (red, blue, green and white) light-emitting diodes. According to the number of pins, variable colour light-emitting diode can be divided into two-terminal variable colour light-emitting diode, three-terminal variable colour light-emitting diode, four-terminal variable colour light-emitting diode and six-terminal variable colour light-emitting diode. The flashing light-emitting diode is a special light-emitting device consisting of a CMOS integrated circuit and a light-emitting diode, which can be used for alarm indication and under-voltage and overvoltage indication. When using, the flashing light-emitting diode does not need to be externally connected with other components, so long as the appropriate direct-current working voltage is added at the two-end of the pins of it to flash and emit light. Ordinary light-emitting diodes belong to current-controlled devices, and the current-limiting resistors with appropriate resistance values should be connected to each other when used. Voltage-controlled light-emitting diode integrates light emitting diode and current limiting resistor, which can be connected directly to both ends of the power supply when it is used. Infrared light-emitting diodes, also known as infrared emitting diodes, are light emitting devices that can directly convert electrical energy into infrared light (invisible light) and can radiate it out. It is mainly used in various optical control and remote control emission circuits. The structure and principle of infrared light-emitting diodes are similar to those of ordinary light-emitting diodes, but the semiconductor materials used are different. Infrared light-emitting diodes are typically made of gallium arsenide (GaAs), gallium arsenide (GaAlAs), in a fully transparent or light blue, black resin package. Light-emitting diode (LED) is a kind of semiconductor electronic component which can convert electric energy into light energy. The electronic component appeared as early as 1962, emitting only low-light red light at early stage, and later developed versions of other monochromatic lights, which now has light throughout visible light, infrared and ultraviolet light, and the luminosity has increased to a fairly high degree. With the development of technology, light-emitting diodes have been widely used in display, TV lighting decoration and lighting source. With the development of the industry, technological breakthroughs, and the application of vigorously promote, LED lighting efficiency is also increasing and the price is constantly lower. The emergence of new combined tube sets also increases the power of a single LED. Through the continuous research and development of the same industry, the breakthrough of new optical design, the development of new lamps, the single product situation is also expected to be further improved. The improvement of control software also makes the use of LED lighting more convenient. LED, known as the fourth generation light source, has the characteristics of energy-saving, environmental-protection, safety, long-life, low power-consumption, low heat, high brightness, waterproof, micro, shock proof, easy dimming, beam concentration, easy maintenance, and so on. It can be widely used in all kinds of pilot light, display, decoration, backlight, general lighting and other fields. Advantages of LED: high electro-optic conversion efficiency (close to 60%, environmental protection, long life (up to 100000 hours), low working voltage (about 3V), lossless life of repeated switches, small volume, less heat, high brightness, rugged and durable, easy dimming. The color is varied, the beam is concentrated and stable, and the start-up has no delay. Disadvantages of LED: high starting cost, poor color rendering, low efficiency of high power LED, constant current drive (special drive circuit required). In contrast, there are certain defects in traditional lighting. Incandescent lamp: low electro-optic conversion efficiency (about 10%), short life (about 1000 hours), high heating temperature, single color and low color temperature. Fluorescent lamps: low electro-optic conversion efficiency (about 30%), harmful to the environment (including mercury and other harmful elements, about 3.5-5mg/pic), non-adjustable brightness (low voltage can not start glow), ultraviolet radiation, flicker phenomenon, large size, slow start, The increase in the price of the raw materials (the ratio of phosphors to costs increased from 10% to 60%~70%), the repeated switching affects the life. High-voltage gas discharge lamp: large power consumption, unsafe use, short life, heat dissipation problems, mostly used for outdoor lighting. With the rapid progress of LED technology in the 1990s, its luminous efficiency exceeded the incandescent lamp, the intensity of light has reached the candlelight level, but also the color has covered the whole visible spectrum range from red to blue. This technological revolution from LED levels to beyond general-purpose light sources has led to new applications such as automotive signals, traffic lights, large outdoor panchromatic displays, and special lighting sources. Since the mid-1980s, monochrome and multicolor displays have been introduced, most are text screens or animation screens at first. In the early 1990s, with the development of computer technology and integrated circuit technology, the video technology of LED display screen was realized. TV images can display directly on the screen, especially in the mid-1990s, the blue and green ultra-high brightness LED was successfully developed and put into production rapidly, which greatly expanded the application of outdoor screens with areas ranging from 100m to 300m. At present, LED display screen has been widely used in stadiums, squares, venues and even streets and shopping malls. Navigation lights have been using LED as light source for many years, and the present work is to improve and perfect. Road traffic lights have made great progress in recent years, the technology is developing rapidly, and the application is developing rapidly. Its advantages are long life, power saving and maintenance-free effect is obvious. At present, the peak wavelength of red LED is 630nm, yellow is 590nm and green is 505nm. It should be noted that the driving current should not be too large, otherwise the high temperature in the summer will affect the life of LED. Ultra-bright LED can be used as brake lamp, tail lamp and direction lamp of automobile, and can also be used in instrument lighting and in-car lighting. It has obvious advantages over incandescent lamp in vibration resistance, power saving and service life. In addition, when it used as brake light, the response time is 60ns, much shorter than the incandescent (140ms), which increases a safe distance of 4m to 6m on a typical highway. As the backlight of liquid crystal display, LED can not only be used as green, red, blue, white, but also as color-changing backlight. And many products have entered the production and application stage. Due to the increase in brightness of light-emitting diodes and the decline in price, coupled with the long life, power saving, easy drive and control than neon lights, and it can not only flash, but also change color during lighting, so it is made of various ultra-high brightness LEDs to decorate the tall buildings, bridges, streets and squares and other landscape in the cities, presenting a colorful, starlight and streamer scene. LED lamp has the advantages of anti-vibration, suitable for battery power supply, solid structure and portability. It will have a great development in special lighting source. As lawn lights, buried lights, microscope field lighting, flashlights, medical lighting, museum or painting exhibition lighting and reading table lamps. At first, LED was used as the indicator light source of instrument. Later, various kinds of light-colored LED were widely used in traffic signal lights and large-area display screen, resulting in good economic and social benefits. Automobile signal lamp is also an important field of LED light source application. Due to the fast response speed (nanosecond level) of the LED, the driver of the trailing vehicle can be informed of the driving condition as soon as possible, thus reducing the occurrence of car rear-end collision accident. In addition, LED lights in outdoor red, green, blue full-color display, keybutton miniature flashlight and other fields have been used. 1) LED chip used in the physical condition is not good, and the brightness decay is faster. 2) There are defects in the production process. The heat dissipation of the LED chip can not be well derived from the pins, which leads to the increase of the attenuation of the chip because of the high temperature of the LED chip. 1) The LED is a constant current drive, and some of the LEDs are driven by voltage to cause the LED to decay too fast. 2) The driving current is greater than the rated driving value. Samll size: LED is basically a very small chip encapsulated in epoxy resin because it is very small and light. Low voltage: The power consumption of the LED is quite low, and generally speaking, the operating voltage of the LED is 2~3.6V, that is, only a very weak current is required to light normally. Long service life: The service life of the LED can be up to 100,000 hours under the proper current and voltage. High brightness, low heat: The LED uses cold light-emitting technology, which produces much lower heat than ordinary lighting lamps and lanterns of the same power. Eco-environment: LED is made of non-toxic materials, unlike fluorescent lamps containing mercury will cause pollution, and LED can also be recycled. Blu LED is a blue-emitting LED. In 2014, Yuji Nakamura and Hiro Amano won the Nobel Prize in physics for "inventing high-brightness blue light-emitting diodes, bringing energy-saving and white light sources." The invention of blue LED enables humans to gather together a three-primary colours LED, that emits trichromatic light so that it can produce enough bright white light with LED. The invention of the white LED lamp greatly improves the lighting efficiency of human beings. Two breakthroughs in the late 1980s laid the foundation for the invention of blue LED: one was the development of epitaxial technology of gallium nitride and the another was the doping of P-type semiconductors. Blu LED contains several different (GaN) layers of gallium nitride. The lighting efficiency, adding indium (In) and aluminum (Al) in LED, is greatly improved. The invention of blue LED enabled humans to use LED to produce white light that was bright enough, and the efficiency of the white LED is much higher than that of the incandescent lamp. White LED promotes the invention of all kinds of LED display screen, and also promotes the improvement of lighting efficiency. In particular, the latter makes it possible for humans to reduce carbon emissions and combat climate change. There are also concerns that blue light emitted by blue LED could do harm to the human eye, because blue light can cause macular degeneration. LEDs have much lower steady-state current than incandescents, and their initial turn-on current can be much higher for a few microseconds of each half-cycle of AC line voltage. Therefore, a spike of current can be seen at the beginning of each AC half-cycle. Typically, the current spike for an AC replacement lamp is 6 to 8A peak; the steady-state follow current is less than 100mA. An LED flood lamp for a recessed ceiling fixture designed to replace a typical filament unit that produces 750 lumens consumes only 13W in contrast with the old filament unit, which normally draws 65W. Designing an AC circuit for controlling LED light output is very simple when using the newest triac designs, such as the Littelfuse Q6008LH1LED or Q6012LH1LED Series, because the only components required are a firing/triggering capacitor, a potentiometer, and a voltage breakover triggering device. Two inverse parallel sensitive gate silicon-controlled rectifiers (SCRs), such as the Littelfuse S4X8ES1, can be used as the voltage breakover triggering device, allowing the controlling circuit to produce a wide range of light level outputs. Also, using these components as the triggering device allows achieving a low hysteresis control because two SCRs form a full breakback trigger. If the application doesn’t demand a wide control range and low hysteresis, a simple variable light control may be designed using quadrac devices, such as the Littelfuse Q6008LTH1LED or Q6012LTH1LED Series (Figure 1). (A quadrac device is a special type of thyristor that combines a diac and a triac in a single package.) The circuit shown in Figure 2 minimises the component count by combining the diac triggering device and an alternistor triac in a single TO- 220 isolated mounting tab package. This control circuit allows a little lower full turn-on voltage due to higher VBO switching of the diac trigger device but offers a light dimming function that operates from 175° to <90° of each AC half-cycle.